Today, I'm going to write something which will most likely upset everybody. It has been 120 years, and the battle lines are clearly defined in everyone's mind. They know to never cross the line. If you are "Orthodox", the worst thing in the realm of halacha, is to smell of being "Reform". If you are "Reform", the worst thing to do is to ever do something the way the "Orthodox" do it. As I mentioned in an earlier post, the Reform movement, is the most "successful" of all Jewish movements. However, considering the poor success of all Jewish movements, this isn't really very impressive. For every Jewish movement, it is easy for the people who are not part of it to point out "where it went wrong." It is also easy for us to look at the movement that we associate with, and point out "where it went right." What is harder for us, is for the Orthodox to look at Reform and point out "where they went right" (pun not intended), or for the Reform to point to the Orthodox and do the same. That however is the purpose of this post. From the point of view of Halacha or halachic adherence, nothing is as damaging as Reform Judaism, outside of the Kaarites and Samaaritans1. However, the fact is that most Jews in America who associate themselves with the Jewish religion, do so as Reform Jews, and more Reform Jews pass on reform Judaism to the next generation, then any other "sect" of the Jewish religion. And so, I want to go through the Pittsburg platform (which most of is likely no longer relevant today) And point out that 90% of the things they wrote were actually correct. The 10% where they were mistaken, is actually the most important parts. However, because of the 90% that they wrote, it has forever injured Halachic Judaism. My source for the Pittsburgh platform is from here, I will assume it is correct. 1. We recognize in every religion an attempt to grasp the Infinite, and in every mode, source or book of revelation held sacred in any religious system the consciousness of the indwelling of God in man. We hold that Judaism presents the highest conception of the God­idea as taught in our Holy Scriptures and developed and spiritualized by the Jewish teachers, in accordance with the moral and philosophical progress of their respective ages. We maintain that Judaism preserved and defended midst continual struggles and trials and under enforced isolation, this God­idea as the central religious truth for the human race. This first paragraph can be argued in "important" minor details and use of language. And that is precisely why it was written, to shift the idea of Gd, to that of "God in man", and to make claims about "Godidea" rather than Gd. However, other than that it is my guess that this paragraph kept Reform Judaism within Judaism. Because of the principles of the Rambam, that Gd can not be defined by human language, I will, for the sake of Jewish Unity and using the principles of Halachic Minimalism, just say that this paragraph is "fine". Nothing here to argue about. The paragraph also seems to grant legitimacy to non-Jewish religious texts, but also here, as long as those non-Jewish religious texts preach the Unity of a single Gd, that seems to be ok within Halacha. Here to, except for the language, and saying "the primitive ideas", the paragraph is mostly correct. If they were more interested in the unity of the Jewish people, perhaps instead of writing "the Bible reflecting the primitive ideas of it's own age", they could have instead written, "the Bible was written principally for the people of it's own age, and was written "in the language of man". Ofcourse, because this led to a general delegitimization of the Torah and Halacha, culturally, within orthodox Judaism this idea was "purged." For many Halachic Jews, the writings of Radak, Rambam, and Ibn Ezra on this topic are largely ignored. The logic appears to be, that since Reform Judaism started with this platform, we must protect against it, lest it lead to a laxity in Halacha. As far as I can tell from my research, it was at this point in History, that the arguments between the Chasidim and Misnagdim ended, and the Chasidim "won", with most of the Litvish world, being unwilling to risk their students becoming "Reform." While the Haskalah in general, normally gets the credit for this, if one looks at the timeline, they will notice that the Haskalah was strong in 1797 when misnagdim managed to have the Russian government arrest 22 Chasidim. (Though the platform is from 1885, these ideals had been behind the Reform movement since the 1820s) The point here, is that until these beliefs, became associated directly with reduced halachic practice, "Orthodox" Judaism freely associated with either the Rambam or Ramban. Afterwards however, only the Ramban was held as a communal norm in both America and Europe, requiring the creation of yet another movement, "Modern Orthodoxy" or "Neo-Orthodoxy." 3. We recognize in the Mosaic legislation a system of training the Jewish people for its mission during its national life in Palestine, and today we accept as binding above all, its moral laws and such ceremonies that elevate and sanctify our lives today. However, those laws and ceremonies which are not adapted to the views and habits of modern civilization must be taught and maintained, for the messianic era, when we will return to our national life in Palestine. 4. 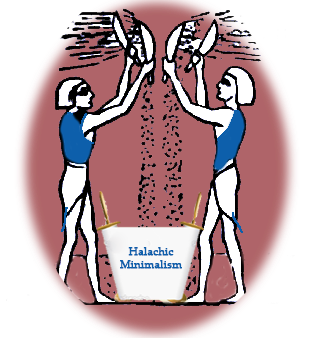 We hold that all such Mosaic and rabbinical laws as regulate diet, priestly purity, and dress originated in ages and under the influence of ideas entirely foreign to our present mental and spiritual state. We will therefore double our efforts to uplift our mental and spiritual state, so that these ideas will once again make sense to us. They fail to impress the modern Jew with a spirit of priestly holiness; their observance in our days is apt rather to obstruct than to further modern spiritual elevation, and thus we will find ways to make these observances impress the modern Jew, searching for any source from which we can gain insight. I suspect however, that this would not have been possible, since at that time the Jewish people were mostly strangers among the nations, rather than a nation of their own. However, it should be recognized that the basic thrust of their paragraph was and likely still is, entirely true. The natural, rather than principled, changes and lack of changes within the Halachic Jewish community, has caused inconsistencies, and imperfect situations which requires each person to find their own logic or meaning in the mitzvot which we do or do not do today. As a nation, our mental and spiritual state does not meet the needs of our mitzvot. Different periods of the galut, made these inconsistencies more or less noticeable over time, but while we were in galuth, and while the beit hamikdash remains destroyed, these inconsistencies will always exist. However, again, because of the fear of "Reform", and the lack of a national Jewish existence, we had been unwilling or unable to tackle these issues. Today however, we have a national Jewish existence, and therefore, I feel confident that we have the tools, using a halachically minimal approach, to both address the needs of our current mental and spiritual states, and also to have the confidence and assurance, that by doing so, we will not be lost to assimilation. As long as the halacha is our intellectual foundation, we can rely on the physical foundation of being the majority in our own nation, to support the needs of the people. Here their fatal flaw is clearly stated. I do not think I need to go into this further. But what I think should be noted, is the "fear" that crept into the orthodox world, of phrases such as "kingdom of truth", "social justice", "peace among all men". (These phrases became replaced with "Torah true", "Jewish Justice", and "Peace in our homes" ) These ideas became associated with a rejection of halacha, rather than a fulfillment of it. It should be noted however, that books such as "The Master Plan", and Tanach, make it clear that a "kingdom of truth, justice, and peace among all men", is in fact the goal of Halacha. But for too long in our exile, the goal of halacha has been the perpetuation of halacha. Waiting for one day, being back in our national homeland. Ironically, this is almost a direct summary of the position of the Rambam. Again, a great Jewish idea was "lost" for generations among the majority of "Orthodox" Jews. I wonder how many Orthodox Jews today would fully support this message if they were not told of it's source, or if they were told that the source was a person whom they respected. This paragraph is important, both correct and severely flawed. To me, it is not clear if this paragraph is a response to Christianity, or a response to the beliefs of Jews at that time. But everything in the paragraph, save the line about the bodily resurrection, is correct. Gehenom, and Eden are not places for everlasting punishment or reward. Ironically, it is only because of a bodily resurrection, that Eden is not everlasting. On the other hand, a sophisticated understanding of a "techei Hamatim" does seem to be absent in our modern era. Everyone has their own pet theory and understanding, but there does not seem to be a single understanding that all followers of Halacha can rally behind. What a great goal and desire! Such a shame that it has been surrounded by cynicism and viewed as a rejection of Judaism and/or Halacha! If there was only one change to Reform Judaism that I could have made, it would have been to remove this from the platform! Perhaps then, all Jews, Reform or Orthodox, or any other movement, would all be involved in fixing society for all people, as the prophets instruct us to do. Instead however, these catch phrases have become rallying points, and phrases of identity. You are either on the team of social justice, or you are not. Each cause, and each action is not evaluated on it's own merits, but based instead on which "group" this now aligns you with. By maintaining a halachically minimal standard, with each group or movement maintaining their own humrot, we can judge everything on it's own merrit, rather than the group it is align with. I hope I have demonstrated, that just three mistakes: The rejection of Halacha, The rejection of the land of Israel, and the rejection of a messianic future, have caused damage to both Jewish Unity, and the ideas and practices of people who would otherwise consider themselves Jews who follow Halacha. While also demonstrating, that acknowledging reality, and the world we live in today, and the ideals of the Torah, can unite us, and bring all the Jewish people towards one goal, which will not only help us, but help the world as well. 1 Food for thought. Why didn't what happened to Karaism and Samaritanism happen to Reform Judaism?